Asian seasoning are always a hit in here. Anything with soy sauce and sesame oil, my kids will gobble it down!! I used whole wheat past in here and cooked the broccoli in the same water which makes it easier and more flavorful! Marinate the meat for 20 minutes with 2 tbsp of soy sauce and 1 tsp of sesame oil, some salt and pepper. You can also add chili flakes if you want add a spicy kick to it. Cook the pasta according to package instruction, and add the broccoli for the last 2 1/2 minutes of cooking time. Cook the meat with the onions and add the sugar snap peas at the last minutes to just heat them up (you wanna keep their crunch, so they only need little time to cook). 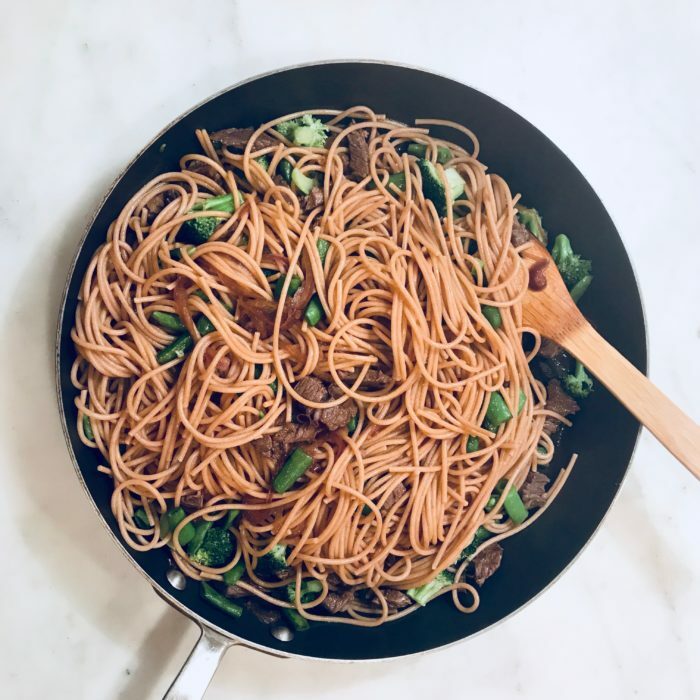 Drain the past and combine with the meat, add more soy sauce and sesame oil and sprinkle the dish with sesame seeds for extra flavor and to make it look pretty!